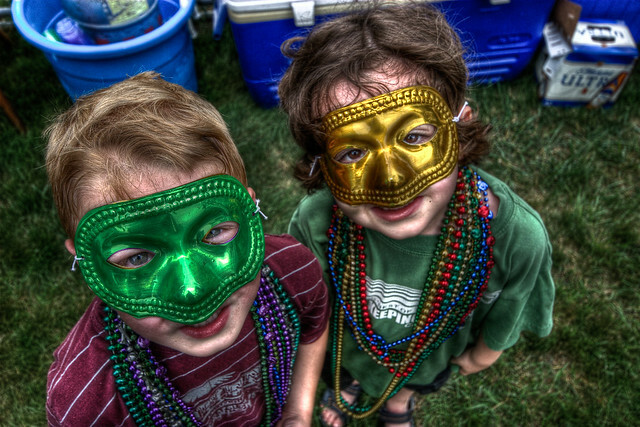 Kids love parties, open-air celebrations, carnivals, and fairs, so it’s only natural for them to wait impatiently every year for the Mardi Gras celebration to begin. If you’re not familiar with the term, “mardi gras” means Fat Tuesday in English and it comes from French. In the US, the event is a big deal and it will be organized on March 4, 2014. Prepare your kids for an adventure and help them get into the spirit by helping them craft their own masks. Prior to moving ahead with the decorative process, paint the simple mask you just bought from the local store. Make it stand out and use striking, imposing colors. Girls usually like their masks to be pink and have all kinds of cute decorations on them, while boys would rather stick to some other types of colors such as green, black, and blue. Let the kids choose! After the mask has been painted, it should be left to dry for a couple of minutes. After that, it’s time to apply the glitter. Use great combinations of gold and silver for example, and make the mask really astounding. Accentuate the eye and the mouth area, and don’t forget to let your kids come up with their own suggestions too. 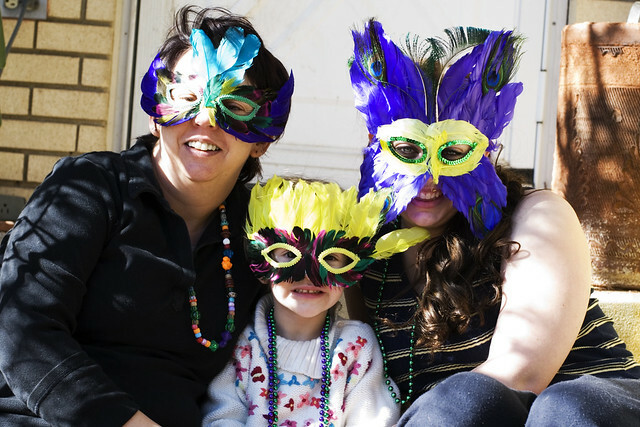 Making masks for a Mardi Gras celebration is so much fun, not to mention that your kids will surely love the end result. After your mask was attentively painted and retouched with glitter, it’s time to apply the fake jewelry. Pour a small amount of glitter on the areas you want to focus and add the beads. After you’re down, place the mask someplace dry and wait for a couple of minutes until the glue has been completely dried out. Now it’s time to put your imagination to the ultimate test. The paint, glitter and beads are all set. So it’s time to start applying the feathers. Once again, opt for pink and white colors for girls, and blue or black for boys. Your kids will love the whole process because it’s fun and engaging. Don’t forget that your little ones will be playing and dancing all the time, so the mask should be tied on the back with a ribbon or an elastic band. Making masks for kids is simple; you just have to be patient! Making masks for a Mardi Gras celebration with your kids might look like an engaging activity (and it is), but also extremely daunting. Kids are picky, they get angry really fast, and they’re extremely indecisive. It’s best to have a glass of wine or two prior to getting started. Just relax and listen to their requirements; it’s the only way to make them happy. Parents are often tempted to buy ready-made masks for their kids. That’s a huge mistake; we all know how pretentious kids can be, so even if they like the mask that you bought today, it doesn’t mean they will like it tomorrow. DIY projects are everywhere – get your inspiration from the web and find a type of masks that might entice your children. Every little girl wants to be a princess, so it’s always a good idea to get inspired from their favorite characters and animations for example. Think outside the box, allow your kids to get involved in the process, and the end result will certainly exceed their expectations. Mardi Gras celebrations are extremely fun and enjoyable! Think of an original template for your kids’ masks and make their day memorable.